A Fitting Name For a Great Pedal The TC Electronic Hall Of Fame Reverb Mini is yet again another example of how TC can cram loads of tech in.. 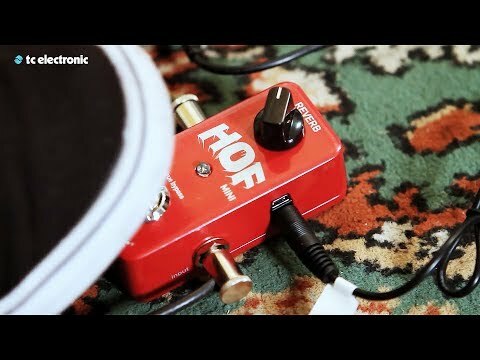 The TC Electronic Hall Of Fame Reverb Mini is yet again another example of how TC can cram loads of tech into a tiny pedal. At a first glance it's small stature and with one reverb potentiometer you would expect for the effect control to be fairly minimal, however this is not the case with thanks to TonePrint . If you're not already familiar with TonePrint from the likes of the vortex flanger or flashback delay it's TC Electronics software which lets users beam different effect algorithms directly to your pedal wirelessly. Ontop of TC's world renowned spring, hall, room, plate and cathedral reverbs the TonePrint editor gives you plenty more options of tweaking with the option of loading signature artist settings directly to the pedal too. When you're not using the pedal and it's still featuring on your pedal board you'll not only save space but reduce unwanted noise with the true bypass feature.